At the opening of the trading session Unified European currency has lost 23 points. Following unsuccessful attempt to break down the upper limit of the trading channel at the level of 1.3444, Euro is trading below the moving average with the period 200, which is a sign of pressure from the bears. If in the near future EUR/USD fails to consolidate above this moving average, the pair is likely to continue decline. Euro is under pressure from German negative data, showing that exports in December decreased by 0.9% losing 0.2% on annual basis. However, Germany continues to hold leading position entailing European economy. Trade balance of Germany is still in the green zone, amounting to 18.5 billion euro. However, Federal Statistics Bureau predicts slow rise in country’s surplus. This week, the most important data will be released on Friday: GDP in France, Germany, Italy and EU and European trade balance. Situation in the Southern countries is gradually improving, economic growth in Spain can be 0.7% this year; in Italy and Portugal GDP levels remain unchanged, which is a good indicator, especially if we recall that a year ago economies of these countries were at the edge of abyss. 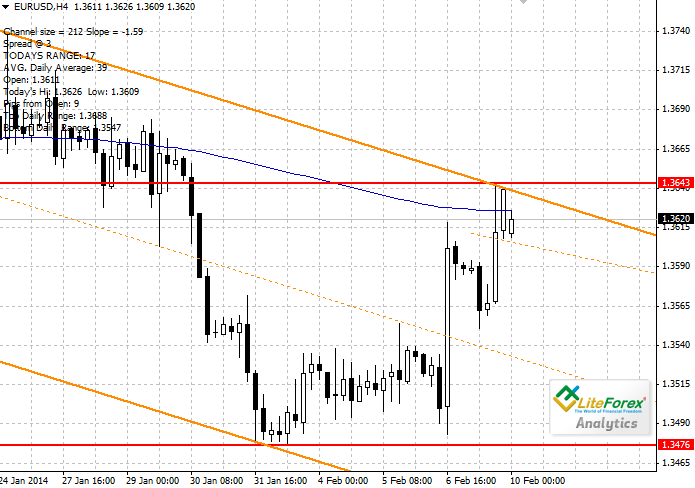 Levels of support and resistance are the bottom (1.3476) and the top (1.3643) limits of the channel respectively. It is recommended to open short positions after breakdown of the level of 1.3600 with protective orders near 1.3643 and a target of 1.3490.